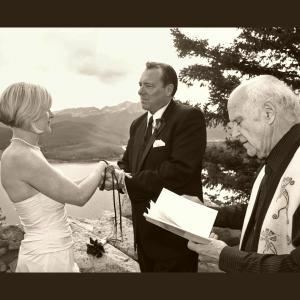 An Ordained Minister Edwin has been creating ceremonies and presiding at weddings since 1982. Ed usually meets with couples at his office in Denver (if possible; otherwise details can be worked over the phone.) Edwin will also publish the final ceremony as a unique book, a keepsake for couples. Of course, Edwin will officiate at the Wedding. The charge for this service is $300 (with reasonable travel fees for Marriages well outside the Denver metro area.) Edwin loves and feels it an honor to create ceremonies and officiate at marriages. Edwin sometimes works with his wife, Marcia, who has been photographing weddings for twenty years. Marcia's fees are quite reasonable and she works in all formats. Marcia and Edwin have been married for thirty years and they highly recommend it!